Dr Hal's Trumps have been designed with learning-through-play in mind. We designed the games only after extensive consultation with teachers and all the games map onto the National Curriculum, in particular with Key Stage 3. All the games are researched by professional experts in the field, and all games have a mixture of subjective and objective Trump Factors. The Objective Trump factors (e.g. 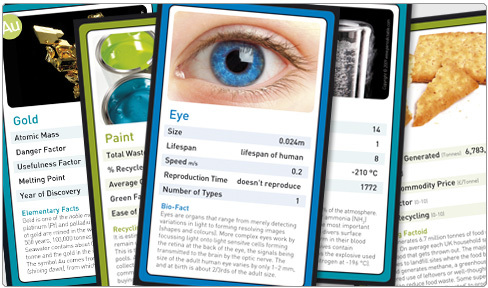 Year of Discovery (Chemistry Trumps), Mass (Physics Trumps), Reproduction Time (Biology Trumps), Total Produced (Recycling Trumps)) are factual and researched from primary sources. Subjective Factors (Danger Factor (Chemistry Trumps), Usefulness Factor (Chemistry Trumps), Green Factor (Recycling Trumps)) are the subjective informed opinions of our professional researchers, designed to create discourse, discussion and informed (and hopefully mild-mannered) debate amongst players. We offer a range of teacher's offers and discounts. We can offer 8 packs of any one title at a cost of £3.50 per pack + shipping, which includes teacher's notes which explain the Trump Factors in some detail, give further details and facts about the cards topics and ideas for further research.